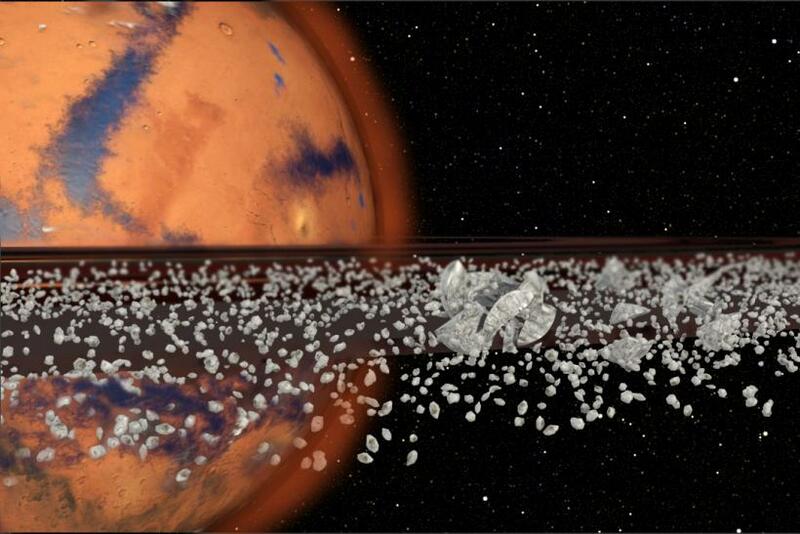 Mars may once have had a ring and would probably have them again sometime in the future, according to a theory put forward by two scientists from Purdue University. The theory, described in a study published Monday in the journal Nature Geoscience, offers insights into where Mars’ two misshapen little moons — Phobos and Deimos — came from. The authors of the study — David Minton and Andrew Hesselbrock — state that about 4.3 billion years ago, a large object (maybe an asteroid) slammed into Mars, hurling out debris and leaving a huge dent on the planet’s surface — a region scientists now believe is the large Borealis basin in the northern hemisphere. This impact, the researchers argue, was powerful enough to blast enough material off the planet’s surface to create rings — ones that coalesced and eventually formed Mars’ moons. However, the story doesn’t end here. The researchers’ model suggests that Phobos has, since its formation, been broken apart by Mars’ tidal forces and reformed three to seven times, with each successor moon being roughly five times smaller than the previous one. Each time the moon broke apart and reformed from the resulting ring, debris would have rained down on the planet, which, the researchers say, can explain the sedimentary deposits found near Mars' equator. It is also possible that the impact directly created Phobos, but the researchers believe it is highly unlikely. For this to happen, the moon would have had to form far from Mars from where it would have exerted a gravitational pull on Deimos on a periodic basis — much like the moons of Jupiter interact with each other. This, in turn, would have altered Deimos’ orbit. If the model outlined in the study is correct, Phobos should once again disintegrate and surround Mars with a set of rings in approximately 70 million years.